Motor Thermal Protector model BPM is the best suited thermostat for over-temperature and burnout protection of all types of AC and DC motors, electric motors, single and three phase motors, induction motors, and all pumps. Motor thermal protector model BPM has been developed by our engineering department after extensive R&D for over temperature and burn out protection of all electric motors and pumps. It is the smallest thermal overload protector in our entire range of thermostats. Due to its small size, this thermostat is very sensitive to temperature rise and current overload. This thermal overload protector has a snap acting bimetal strip and a beryllium copper blade. Due to this there is quick make and break switching and there is no sparking when the thermal cutout switches off the motor. The internal contacts are made of solid silver to ensure long life. The outer body of this thermal cutout is a high temperature resistant engineering polymer. The internal construction of this thermostat is all spot-welded on a stainless steel housing plate. The wires are Teflon lead wires, which can take high temperature. The body of this thermostat is sealed and resistant to dust, dirt, fumes, moisture, gases etc. Due to the small size the response to temperature rise is fast, thereby ensuring complete motor protection during rapid temperature increase. Unlike imported snap action disc thermostats, which have a delayed restart and in which the trip temperature drifts after continuous usage, our thermostats operate on the over center mechanism which provides quick restarting characteristics in applications like pumps and motors when the customer prefers minimum down-time to ensure maximum utilization of his equipment. Imported thermal cutouts consist of merely a bi-metallic strip inside a housing, but our thermostats are true thermal cutouts with a snap acting high temperature copper alloy switching blade and a separate bi-metallic actuating assembly. This sophisticated design ensures stable trip temperature, long life, high reliability and superior current carrying capability. Snap Action bimetal thermostat for quick make and break switching. Small size for easy fitting and rapid response. Solid silver contacts for long life of 1,00,000 operations. 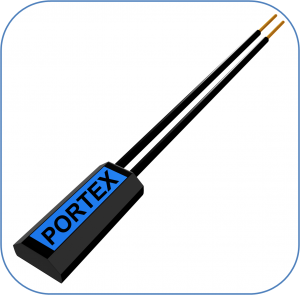 Available for any trip temperature required from 50 degrees C to 160 degrees C.
[a] Electrical Connections – For protection of motors up to 1H.P. the motor protector thermostat is located at the windings and connected in series with the line side of the mains. For larger motors the thermal overload protector is located at the windings and connected in series with the magnet coil of the starter, contactor or other control circuit, as shown below in the case of 3 phase motors. [b] Installation – The thermostat can be embedded or tied to windings at a location where the start and running windings are preferably side by side. This thermal overload protector can even be tied to the overhang (with a high temperature tape) ensuring good heat transfer. The leads are brought out to the terminal box for making connections. For small motor protection, the connection can be made internally in series with the line side. 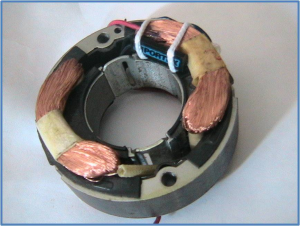 Thus even existing motors can be provided with thermal protector, especially at the time they are opened for maintenance or rewinding. Avoid installing the thermal cutout near any cooling air flow. During the installation, while shaping the windings and fitting the end covers do not hammer or damage the thermal cut-out or subject it to excessive stress. Windings may be dipped in varnish and baked up to 150 C after installation of the thermal cut-outs. 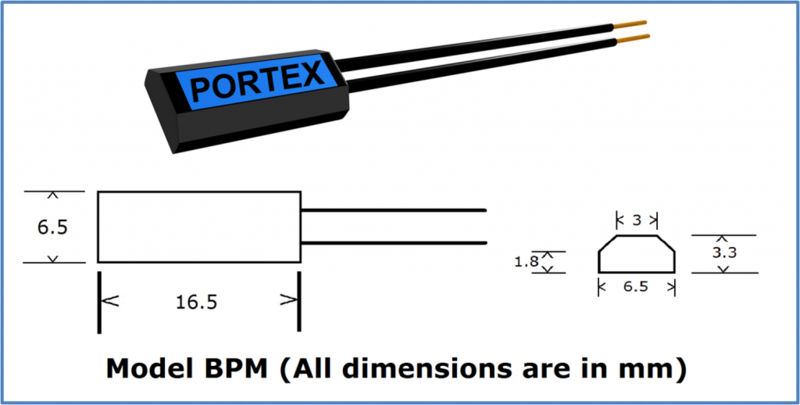 [c] Ordering – When ordering the BPM motor protector thermostat, inform us of the H.P., insulation class (A, E, B or F) and normal full load current of the motor, so that we can provide the correct calibration based on running current. [a] Electrical Connections – In three phase motors, the current in the three phases is not directly interrupted. 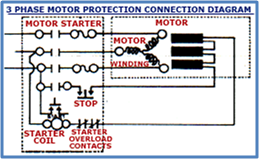 Instead, the starter, contractor or other control circuit which switches on the three phases, is itself disconnected, stopping the motor. Hence, the thermostat located at the windings are wired in series with the magnet coil of the starter, contractor or other control circuit. Use 2 or preferably 3 thermal cut-outs (U.L. regulations of U.S.A. require 3 cutouts for a 3 phase motor), so that a thermostat is in touch with each phase winding to sense overheat in any phase individually. The thermal overload protectors are in, series with each other so that when any of them trips the circuit is interrupted. The leads of the thermal overload protector are guided individually or jointly to the motor terminal box to make the connections (See diagram). When temperature rises beyond the maximum permitted limit for the class of insulation of its windings (i.e, Class A, E, B or F), one of the thermostats will trip and the motor will stop. The smallest to the largest 3 phase motor can be protected this way and you only need to specify the insulation class of the motor. The thermostat rating is independent of the motor H.P. rating, because the thermostat handle only the light loads involved in operating the magnet coil of a starter, contactor or other control circuit. Hence, any size 3 phase motor can be protected. [b] Installation – The thermal overload protector should be embedded in or tied to the phase windings so that one overload protector is located in each phase winding. The thermostats can even be tied to the overhang (with high temperature tape) so that there is good heat transfer from windings to the thermostats. Thus even existing motors can be provided protection, especially at the time they are opened for routine maintenance or rewinding. Avoid installing the motor thermal protector near any cooling air Flow. During the installation, while shaping the windings and fitting the end covers do not hammer or damage the protector or subject it to excessive stress. Windings may be dipped in varnish and baked up to 150 degrees C after installation of the cut- outs. [c] Ordering – When ordering Model BPM inform us of the H.P., insulation class (A, E, B or F). Switching Action SPST Normally Closed (N.C.) contacts which open with a snap action at a preset temperature and disconnect the motor starter from the mains and protect the motor. Restart Mode The motor will automatically restart upon cooling. Adequate precaution must be exercised in motor protection applications where automatic motor restart can cause injury, i.e., power tools, mixie blade, power saws, machinery etc. Fitting or Mounting The thermostat/thermal overload protector needs to be taped or tied on to the windings of the motor so that it can sense the temperature rise. Connections Thermostat/Thermal Overload Protector should be connected in series with the windings for motor protection of up to 1 H.P. motors. For protection of larger H.P. motors or 3 phase motors, one thermostat should be fitted on to each phase winding. All thermostats should be connected in series with each other and in series with the motor starter no-volt coil.